SIMPLY Unclutter your Cabinet or Countertop in ONE EASY STEP with the Extreme Matter's Pots and Pan Rack~ Guaranteed! 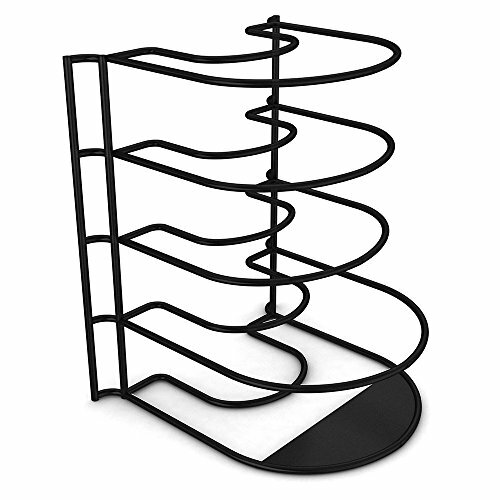 Use this FUNCTIONAL pan rack STANDING UP vertically or LAYING DOWN horizontally. Our PREMIUM, HEAVY-DUTY kitchen pan rack is made from durable metal with a non-stick coating to protect pots, pans, serving trays, casserole dishes, and most lids. Great to use as an aluminum pan rack, a CAST IRON pan rack, non-stick pots and pan organizer or a baking pan rack. COMES READY TO USE. Mounting screws included. No additional hardware needed. At Extreme Matters, we are so confident that you will be pleased with our premium product that if, for whatever reason, you do not absolutely love it, just return it and we will refund your FULL purchase. You have nothing to lose! Purchase TWO and use one as a LID RACK by laying the rack on its side. EASILY accommodates lids. Protect your pots and pans from scratching. Maximize your cabinet and counter space. No more shifting heavy pans around to get to the one on the bottom. Click Add to Cart at the top of the page and relax, knowing you have solved your organizing needs! #1 Way to ORGANIZE Your Pots, Pans, Cast Iron, Griddles, Baking Dishes, Serving Trays, and most Lids with this VERSATILE Rack that can be used VERTICALLY OR HORIZONTALLY on your Kitchen COUNTER or in your CABINETS. Extreme Matter's Pan Rack is SPACE SAVING, FREE-STANDING, EASY to INSTALL and includes optional mounting hardware. 5 TIER PAN RACK with Bottom Tier 1 INCH TALLER for Larger Pans. This HEAVY DUTY organizer also holds CAST IRON. This Pot and Pan Rack is made of PREMIUM, DURABLE, STURDY Metal that is EASY to Clean and PROTECTS your pans from scratching each other. Our Pan Organizer provides a TIDY, EFFICIENT, ORDERLY, CLUTTER-FREE CABINET and COUNTER AREA. If you have any questions about this product by Extreme Matters, contact us by completing and submitting the form below. If you are looking for a specif part number, please include it with your message. 30" Wall mounted pots and pans rack. Pot holders wall shelves with 10 hooks. Kitchen shelves wall mounted with wall hooks. Kitchen storage pot holder pot rack. Pot pan organizer. Pot Pan rack.